A father whose child is dying of leukemia. A Catholic nun who no longer hears God speaking to her. An elderly woman whose husband is suffering from Alzheimer's. A man whose only ambition is to date a centerfold model. Each of these people in the Hulu series The Booth at the End wishes for something desperately enough to seek the help of a mysterious Man who sits in a diner. He can ensure that they get their fondest wish, but only if they complete the task he assigns to them, a task with deep and sometimes deadly consequences. The first five-episode season of The Booth at the End initially ran on Canada's Citytv, but since then, the series has made the jump to Hulu, and is now three episodes into its second season. 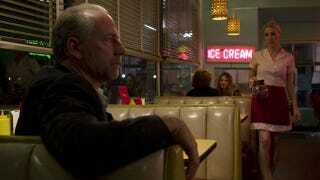 Each season so far takes place entirely inside a diner, where the Man (Xander Berkeley) spends his days sitting in the same booth. Occasionally, someone will come to him, mention something about the pastrami, and slide into his booth. Everyone who comes to the Man wants something slightly different. Some want their loved ones cured of illness. Some want to be better, prettier, invulnerable. Some of them just want to make someone else happy. Some of them are damaged, some selfish, some simply placed in a terrible situation. The man tells them that he can guarantee that they get their wish if they perform the task that he assigns. Then he looks in his book and pronounces a task: this one must build a bomb and set it off in a crowded space, this one must rob a bank, this one must protect a little girl, that one must make a certain number of people cry. If they complete the task and tell the Man all about it, then they will receive what they asked for, no matter how impossible. The Booth at the End is a tale of the perils of wishes and wish fulfillment, but it's not a "be careful what you wish for" story in the vein of "The Monkey's Paw" or so many genie stories. Instead, it's about the tension between wishes and wants. You might wish for a thing, but will you do what you must to get it? And, more significantly, is the thing you wish for really the thing you want? Over the course of each season, the Man meets with a handful of individuals. Sometimes, he sets his clients on assignments that are in direct opposition to one another. Sometimes, he assigns them complementary tasks. Many, but not all, of the stories cross and intersect, so that the Man will be meeting with this thief and that cop, this aspiring murder and that wannabe protector, this father and that son. What's interesting isn't who completes their tasks; some clients will, some clients won't, and some clients will change their minds partway through. What's interesting is what the clients learn about themselves as they progress through their tasks. Many of these clients are ordinary people who were skating through their lives, and never did a daring thing until they met the Man. As they work through their tasks, they begin to learn things about themselves, their own morality, and the things they are truly capable of accomplishing. And more than a few of them come to realize that they needed something very different from the thing they wished for. What's especially innovative about The Booth at the End is that it manages to be a suspenseful drama while taking place entirely within the confines of a diner. One tenet of the Man's deals is that the clients must return to him every now and then and update the Man on their progress. He asks them questions, much like a therapist might: What was this like? How did it make you feel? What does it mean to you? What are you going to do now? This means that the series depends entirely on a series of monologues and dialogues, and the production team has managed to attract an impressive array of highly skilled (and vaguely familiar) character actors, who can deliver long speeches about plotting a murder, helping a shut-in, acquiring and firing a gun, and kidnapping a child without erring too far into melodrama. Berkeley, for his part, plays the Man as mysterious, but not hollow. He is difficult to faze, but capable of surprise, and while he often seems wearily detached from his clients, he also possesses an unexpectedly avuncular side. When things go well for his favorite clients, the Man seems genuinely pleased. But then again, he's well aware that things don't always go well. And that's where The Booth at the End is its most chilling. No one will come out of their tasks unchanged, and some won't even come out alive. While some clients arguably find the fate that they deserve, The Booth at the End comes down firmly on the side of "Sometimes bad things happen to good people." It would dreary to have the Man sit as Thoth in the underworld, recording the weights of human hearts and awarding them prize or punishment. Instead, the series stands as an unsettling morality play, as if the Man and his book were relics of The Twilight Zone who decided to tarry in our universe a little bit longer. So what is the Man, then? Is he a comic psychologist? A research student from another dimension come to study human morality? Or is he, as one of his clients suggests, the Devil himself? It doesn't really matter. What matters is that the Man has wants and desires just like his clients do. And in the second season, we learn what the book will ask of him, and, we hope, how his task will change him just as he's facilitated the change of so many others.